about their new single, First Snow, and why they decided to write something wintry. I discover how Crimson Calamity got together and whether there will be more material next year; what sort of music they are driven by and which rising artists we need to get behind. Lauren and Mallory share favourite memories from their career and tell me what tour dates are coming up; the artists they’d support on the road if they had the chance – they select some cracking tracks to end things with. Hey there! We are well. Thanks for asking. Just super-excited for the release of this single and the Holiday season! Absolutely! 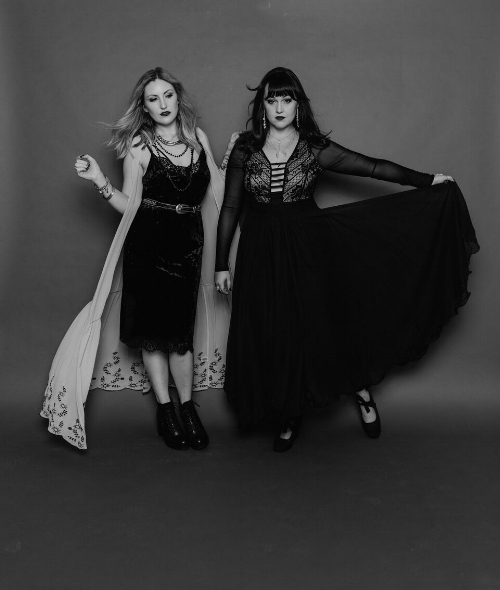 We are Lauren and Mallory, a Roots-Rock/Americana duo called Crimson Calamity, living in Nashville. First Snow is your new single. Was there a particular moment that inspired it - or did you want to create something with a winter/Christmas vibe? We had wanted to write a Christmas song for some time and, when we finally sat down to do it, this idea of a loved one waiting for a soldier to come home developed. We wanted to make it somewhat timeless and not from one particular person’s perspective because love comes in many forms and so many people can relate. The Holidays can be such a wonderful happy time, but they can also leave people with a yearning or melancholy and we wanted to write something for the ones who wait. Absolutely! We are currently writing for our next E.P. and we will be back in the studio March 2019. How did Crimson Calamity start? What brought you together? We met in college and did a lot of collaborating over the years. We decided to form our band in 2014 when we were participating in a monthly songwriting challenge that led to us writing two songs inspired by Calamity Jane. They would give us different themes to write about. One particular month’s theme was to write about a historical event or person. The songs sparked the idea for the band so we decided to use her as our namesake in tribute. 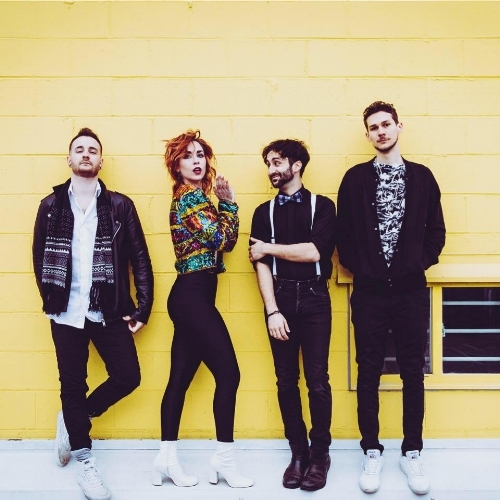 We are both drawn to artists in many different genres but as an influence on our band we are drawn to old-school stuff: Fleetwood Mac, Dolly Parton and Johnny Cash. However, there are also artists in our generation that we love: Brandi Carlile, The Civil Wars; The Lone Bellow, Jamestown Revival; Grace Potter, Jason Isbell and Cam - artists who are telling stories and creating unapologetic, organic and timeless music. Lauren: If I could have anything?! I think I would ask for a new car...probably a Tesla SUV. Is that selfish? Should I have asked for world peace? Mallory: Teslas ARE really nice! I think, for me, a gift card to Trader Joe’s or Whole Foods - large enough for me to buy healthy food from for a few months. I’ve been naughty lately. Too much sugar. We do! We have a show at The Hotel Cafe in Los Angeles on 1/22 at 7 P.M. and then we are headed to the Sundance Film Festival. We are going to be touring, writing and recording the new record in March. Recording our last record was a pretty special memory. We had original band members out from the West Coast and we recorded for the first time at The Sound Emporium here in Nashville. Everything came together in such a special way and we were just pinching ourselves because we felt so lucky. Lauren: I feel like I have had different albums mean the most to me at different times in my life but one that sticks out would have to be Mumford & Sons’ first record, Sigh No More. The lyrics on that record just hit me like a ton of bricks and really resonated with me. That time in my life wasn’t the easiest and it helped me through. One of my favorite lyrics of all time is “There will come a time you’ll see, with no more tears/and love will not break your heart, but dismiss your fears/Get over the hill and see what you find there with grace in your heart and flowers in your hair”. Mallory: This is such a hard question! There are so many albums I love top to bottom. I’m not sure I can pick just one...I think it might be a tie between Aerosmith’s Nine Lives because it’s a symphony of Rock and Roll and I love Steven Tyler…and I still think Sheryl Crow’s self-titled album is a masterpiece. Every single song is absolutely killer. Redhead by Bleu and the ’90s Romeo + Juliet soundtrack are honorable mentions. It’d be so fun to open for an artist like Harry Styles or Chris Stapleton. They’re both amazing writers and vocalists. We also are huge into supporting the ladies so someone like Cam, Kacey Musgraves or Grace Potter would also be amazing. As far as a rider goes, please have whiskey, wine or both. Neat and red respectively. Calamity Jane has a quote: “If a girl wants to be a legend, she should just go ahead and be one”. That really resonates with us because being a woman in the entertainment business isn’t always a walk in the park and we oftentimes have to fight twice as hard to even get heard. It’s so important to hone your craft and know your business. Don’t let anyone try to tone down your voice and don’t be afraid to take up space in this industry. We do! We will be at Knoxville’s Blue Plate Special WDVX on Dec 15th. We are also playing a show in Franklin, TN that night at The Pond. At Truck & Tap in Alpharetta, GA on Jan 13th and, again, you can catch us at The Hotel Cafe in L.A. on 1/22 plus more to come! The best way to keep up with our shows is to follow us on Facebook and Instagram (@crimsoncmusic). Lauren: I am loving Lennon Stella’s new music. She is so talented and I can’t wait to see where she goes. Mallory: Totally agree. Lennon Stella’s new record is fantastic. Also, local Nashville band The Foxies. They totally rock. Look out for them. Fortunately, we are both obsessed with music so we don’t need much chill time away, but I’d say we both like to hang with our significant others and our dogs. We love to go see shows and go out for dinner and drinks too. Taking time for self-care is something we are both trying to be better at. We’re definitely guilty of energizer bunny mode.